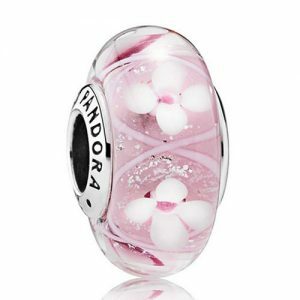 Pandora make a large range of official Pandora glass charms, nearly all of the official charms are made from Murano glass whereas unofficial charms will often be made from normal coloured glass. 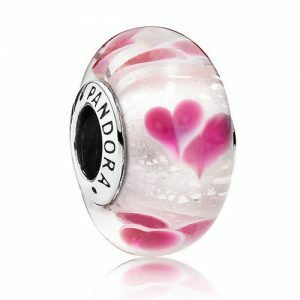 The Murano glass charms come in a huge variety of colours and styles including smooth charms, faceted glass charms as well as charms set on a variety of textured and patterned cores giving a unique eye-catching sparkle. 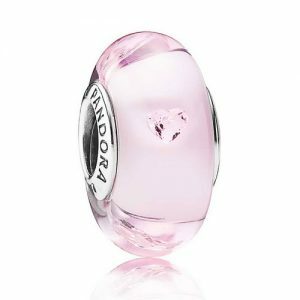 Many of the official charms also contain Cubic Zirconias set into the Murano glass to give that extra touch of elegance. 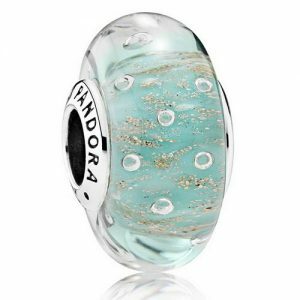 Each Pandora glass charm is handmade using a process called lamp working. This involves molten glass being wrapped around a coated metal rod called a mandrel. The glass can then be decorated to achieve the desired designs. 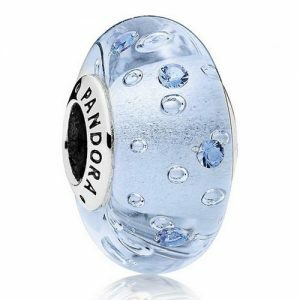 To make the glass charms strong enough to be worn without getting damaged they are slowly cooled and reheated. 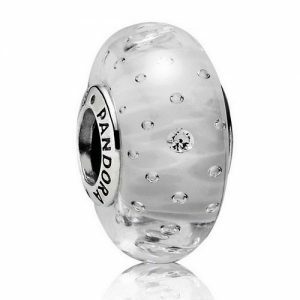 This prevents small cracks forming in the glass which may occur if the glass charms are cooled to quickly. Murano is a small island near the Italian city of Venice. 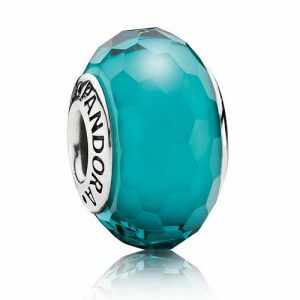 The glass-work created on Murano is world famous and can be found in most gift shops throughout Venice. 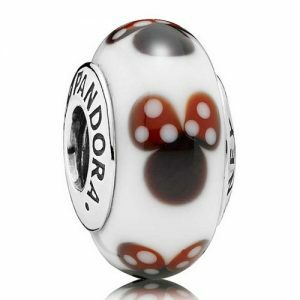 Pandora chose to use Murano glass in their charms as its widely accepted as the best quality glass in the world. 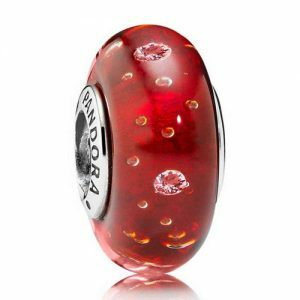 What designs and effects can be created with Murano glass? 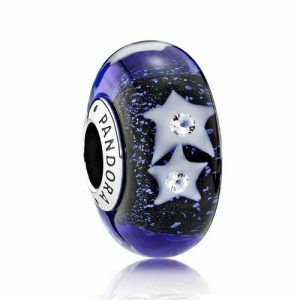 The faceted Pandora glass charms are made in a slightly different way to the other glass charms as the origin pieces of glass are not heated when being applied to the base. The long glass rods are split into smaller pieces then attached to the base. Once attached the beads are faceted with a glass cutter. 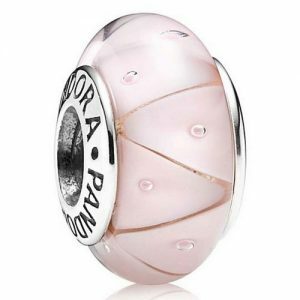 The glass ribbon effect within Pandora glass charms is created by using a piece of glass that is clear on the outside and coloured in the middle, when the original piece of glass is being wound around the base the glass worker will wind it in such a way as to create a ribbon effect within the glass. 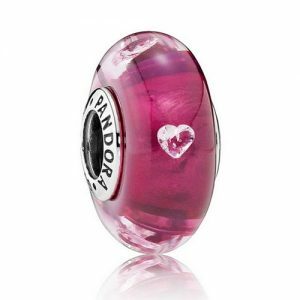 Pandora glass charms 3D effects are created within the glass by using small pointed tools that the glass-worker can press into the glass bead and pull coloured parts of the glass around. 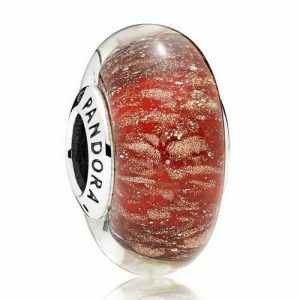 A technique perfected in Murano the frit involves the base of the Pandora glass charms being coated with a layer of crushed coloured glass which is then melted to create a marbled effect. 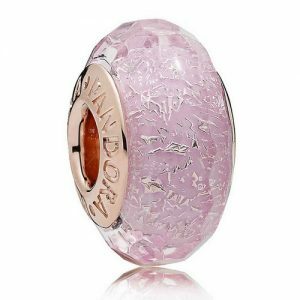 The glass charm is then created in the usual way on top of the frit to give the desired effect. 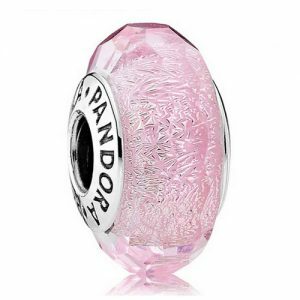 The fizzle effect Pandora glass charms are created by inserting several Cubic Zirconias into the melted glass while its being made, small air bubbles are also made in the glass by using a special tool, once the Cubic Zirconias and bubbles are in the bead an extra layer of translucent glass is added to coat the bead and protect it. 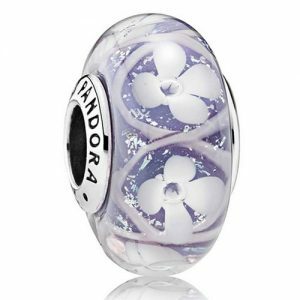 Many different decorative effects on Pandora glass charms can be achieved by adding small pieces of coloured glass to the base of the bead. When the bead is still molten sharp tools are used to pull and push the colours around within the glass to create patterns and images within.